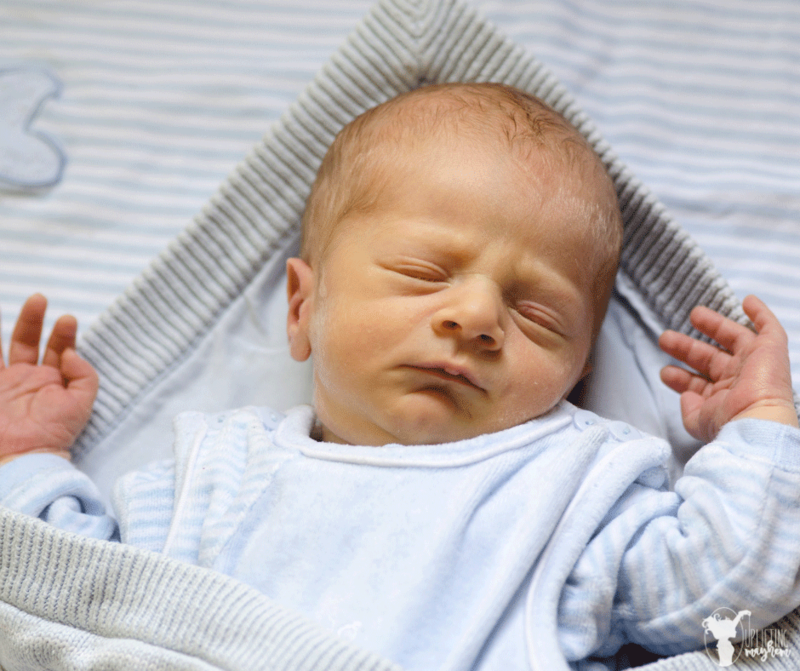 “How do I get my baby to start sleeping through the night? ?” That is the age-old golden question, my friends. I don’t know if there’s ONE correct answer because every child is so different. I do know, however, that my 15 month old who used to wake up 3-5 times a night only to have to be nursed back to sleep, is now officially sleeping through the night. And this is how I did it. First time mama here. I haven’t really got a clue what I’m doing. Though I’ve nannied pretty much all of my life, motherhood is a whole different ball game. I can’t help but feel like I’m striking out on so many things. One of those things used to be our baby’s sleeping habits. 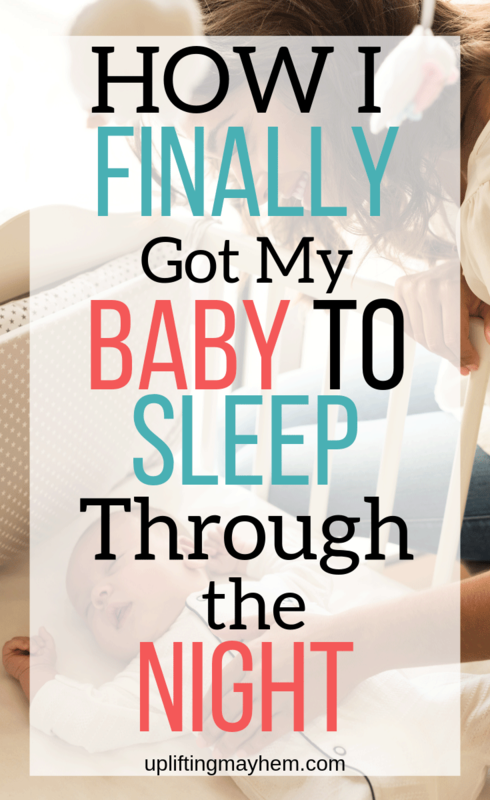 How I FINALLY Got My Baby to Sleep Through the Night! I always told myself I’d sleep train him when he was 6 months old, but 6 months came and went and I couldn’t do it. He still seemed so young and attached to me, and well. . . it was just easier to nurse him to sleep without a fuss. So I kept postponing it. I don’t know if I can necessarily say I was against the cry-it-out method but my heart just couldn’t take letting him cry all alone for more than a few minutes. People mentioned to maybe leave and let someone else hear him cry it out because it’s easier to do when they aren’t your kid. That only broke my heart more. We went for over a year with waking up several times a night, often happening every hour and a half. He was 15 months old and still sleeping like a newborn. At 4 months old he stopped taking a bottle, so he relied on mom to be able to fall asleep. No amount of singing, rocking, stories or cuddling from anyone else would do it. It didn’t take long before we started to feel like we were losing our sanity. Luckily, I had a conference that I had coming up where I would be spending two whole days and nights away. It required us to get some gears in motion so that it wouldn’t be a completely miserable experience for them back at home. My husband and I lay awake one night discussing what approach we wanted to take and the next morning. 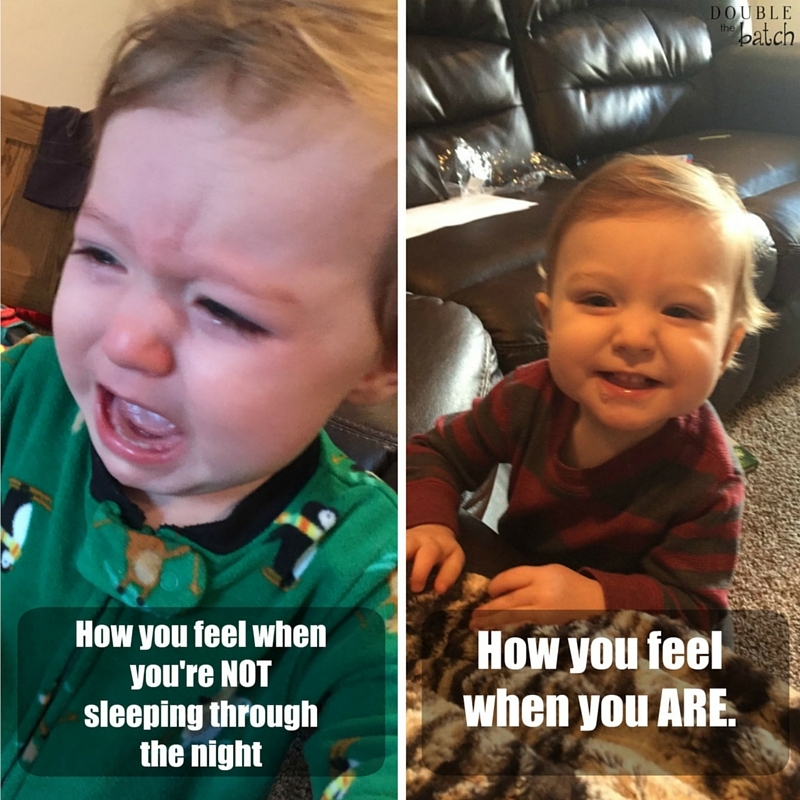 I was surfing Pinterest and came across an article entitled: When Do Babies Sleep Through The Night? Learn The Golden Rule of Amazing Sleep by Susie Parker. Just from that one article I learned that our 15 month old was awake for too many hours out of the day for his age and that his bedtime needed to be moved up. Here I was, sometimes putting him to bed later in hopes that it would make him tired enough to sleep through the night. I didn’t realize that I was only making it worse. From that article I clicked on another article entitled: Battle the 40 minute Sleep Intruder and from there, several more amazing articles on getting my toddler to sleep better in general. I am in LOVE with this ladies’ website you guys (you can get a free 8 page sleep guide/tips sent to your email just by joining her subscriber list)! She’s a certified child sleep consultant and really knows her stuff. After I figured that out, I asked if she would be willing to exchange a sleep consultation for an honest review for our readers. Best part? I told her we wanted a gentle approach and that’s exactly what we got. We never felt forced to do any one method and she worked with us to find out what would best fit our needs. So here I am, well rested and doing happy dances because finally, after 15 very long months, we are all getting a full nights rest. And I’m here to give you 3 of the steps that got us there. 1.Make the decision together as a couple. If your baby is already used to a certain way, changing things up can be really hard. It’s important that you and your husband decide together that you’re both on board with the new plan. It won’t work if one person is trying to change things up while the other person sticks with the old. This will only confuse your baby and get you nowhere. By doing this, it will also make it so that you have good support when you feel like giving up and reverting back to old habits. My husband and I had talked about it off an on but when we finally took the time to really sit and talk through the details and decide to both be 100% committed, that was when things started moving the right direction. We did a lot of research on different sleep training methods to find what would work best for us. (There are loads of books out there on this subject!) While you’re looking everything over you can pick out the different things you like and don’t like and come up with an educated plan on your own or you can do what we did and have Susie from Sleep Baby Love create a personalized plan for you as part of her 2 week consultation. Susie had me fill out a comprehensive form for her to be able to assess the specific needs of my son and then we talked on the phone about a few different methods that she thought would go well with him. It was important that we personally felt comfortable with everything in the plan. Before the end of the night, we had a personalized sleep plan sent to our email. Whichever way you decide to form it, having a plan, printing it out, and setting a date is important to success because it’s more concrete, you can refer back to it when you feel like giving up, and it makes it easier for everyone to be on the same page (Mom, Dad, siblings, babysitters, etc. . . ) so as not to confuse your child. I’ve already talked about this a little in both of the previous steps but I’ve come to learn that being consistent is KEY. I had “tried” on several occasions, without a plan, different things to help my son sleep better, but I never stuck with one specific thing. It always seemed easier just to nurse him back to sleep. I was never fully consistent. Once you have a plan and a timetable, follow through with it! I learned that even if it works wonderfully one night, and not so wonderfully the next, it’s important not to go back. After doing some research, talking with Susie, and acknowledging that my heart can only handle so much, I chose a plan that I knew I could be absolutely consistent on. I then gradually made it a little harder when I felt we could all handle it. You know you and your baby. Pick something you can improve and be consistent on instead of one that’s too hard that you feel you might give up on. Also, make sure you’re being consistent across the board with everyone who might be taking care of your baby. My sister lives with us and before my husband and I would leave anywhere, we made sure she knew our sons new sleeping routine so that all of our hard work wouldn’t be erased. Hopefully one or all of these tips will help take you one step closer to a full nights rest. It’s certainly worked for us and our world is ROCKIN’ because of it! I wish I had done all of these things so much sooner so that not only my husband and I could sleep better, but our son could as well. Half way through our sleep training, our son caught a nasty sickness that lasted over a week. Normally, when he’s sick, we don’t even count on getting any sleep as he’s up all night miserable. This time around, because he had learned how to fall back to sleep on his own, he surprised us with still sleeping through the night. I was so grateful we had gone through those necessary sleep training steps so that he could get the rest he needed to heal. How do I Motivate my Child to Read?